On November 24, 2016, the Colombian government and the Revolutionary Armed Forces of Colombia-FARC, signed a historic agreement for the definitive termination of decades of violent conflict in the country. The Peace Agreement was made after almost 5 years of negotiations between the parties. But, since the Agreement, Colombia has remained polarized between those who support and oppose the terms of the negotiation. The implementation of the agreement has not been off to a good start. In a region where the word “peace” has often been influenced by political motivations, leaders are needed now more than ever to take on the role of rebuilding the country’s social fabric, as it has been disrupted by more than half a century of conflict and violence. Working for peace in Colombia means joining forces from different fronts and weaving a strong network that supports the vision of a new country where all actors play an important role. 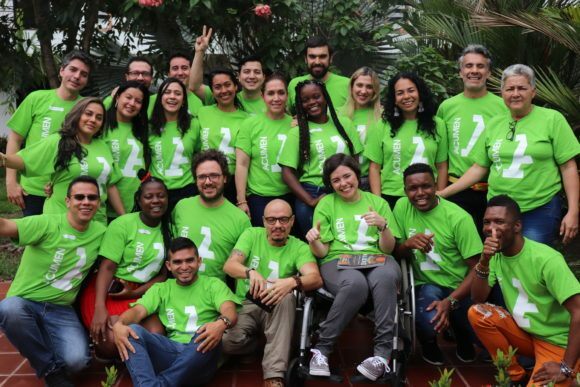 Recently, as the country faced a crucial juncture in the fate of the Peace Agreement, the first cohort of 23 Acumen Colombia Fellows met for the first time at the first leadership seminar. The topic of peace was prominent, guiding conversations about the future of leadership in Colombia and the role the Fellows themselves must take on to ensure a peaceful future for the country. And above and beyond their individual roles in pushing toward peace, the Fellows understood that change must take place through collaboration. In a powerful moment of shared purpose during the Fellows short week together at the leadership seminar, they decided to come together to create a public statement on the importance of diversity and working together across lines of difference to build lasting change. This public statement is just a starting point. Written as a manifesto, it’s a device to help guide the cohort’s future work together. It also signifies that these 23 leaders are not alone—they are part of a community that stands together, united for systemic social change and the shared goal to eradicate the country’s inequality. We believe that in order to shift systems and shape society, the voices and actions of people who have different knowledges, contexts, and trajectories need to be part of the conversation. The world is craving moral leadership: individuals that can see beyond themselves, who define success as a collective variable, and not just an individual one; individuals that can find common purpose with diverse stakeholders and are willing undertake the lifelong responsibility to build a world based on peace and dignity. 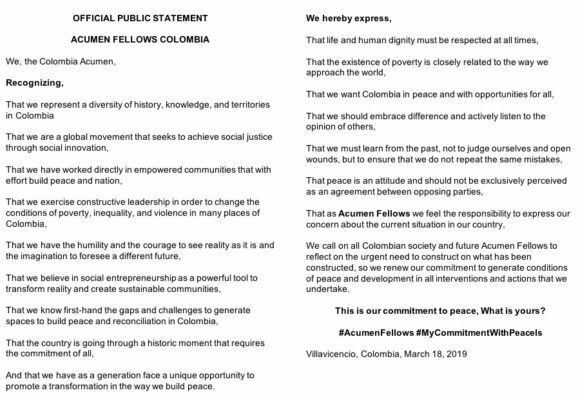 This is the 2019 Colombia Fellows’ commitment to peace, what is yours? What Do We Owe Smallholder Farmers? Everything.